Popular Swiss driver Jo Siffert scored his maiden victory at the British Grand Prix driving a Lotus 49 run by the privateer Rob Walker, who had backed Stirling Moss in the past. Siffert had been driving for Walker for several years, but the previous March had wrecked his new Lotus-Ford at Brands Hatch; they were only able to continue because Colin Chapman supplied them with the late Jim Clark's Tasman car until their new one was available. 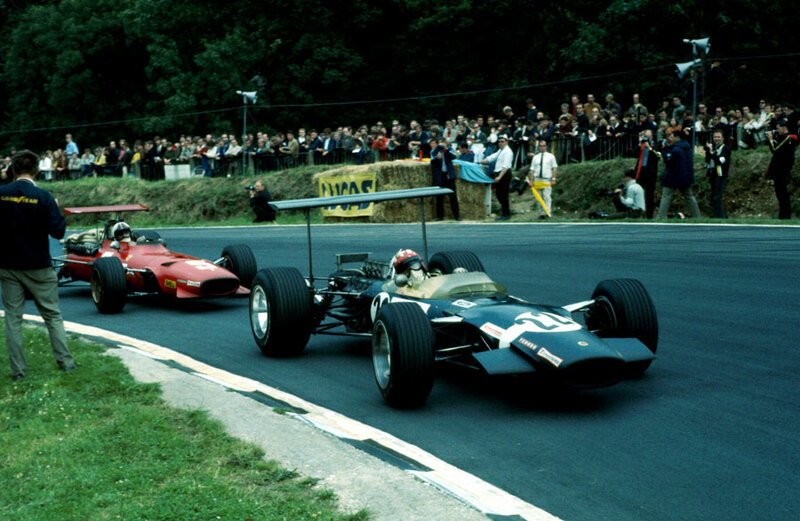 Championship leader Graham Hill dominated qualifying, setting a string of lap records, and his Lotus team-mate Jackie Oliver, who counted Brands Hatch as his local circuit, was next to him on the front of the grid. Oliver used that knowledge to lead at the start from Hill and Siffert, but Hill overtook his young team-mate after a few laps only to have a joint in the rear driver-shaft collapse forcing him into retirement. Behind them, a number of drivers struggled on wet tyres after the expected downpour at the start failed to materialise. Oliver resumed the lead for 17 laps before his transmission failed, leaving Siffert and the Ferrari of Chris Amon alone at the front. But with his rear tyre disintegrating, Amon, who briefly led, had no option but to back off and allow Siffert to take the chequered flag. John Surtees managed fifth even though the rear-wing aerofoil fell off his Lotus, leaving it a handling nightmare as it weaved all over the place. In sixth was Jackie Stewart who was still severely hampered by a serious wrist injury and who was so exhausted he had to be lifted out of his car at the finish.